Online registration has ended, but don't worry! You can still register to walk at the event! 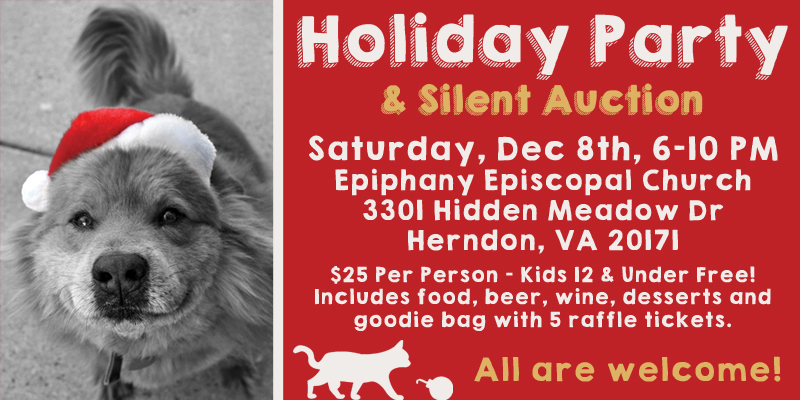 Join us for HART's Annual Holiday Party in the beautiful Great Hall at Epiphany Episcopal Church in Herndon / Franklin Farm! We'll have our fabulous Silent Auction plus Raffle Prizes, and all proceeds will help HART continue to save the lives of dogs and cats who need our help. We can't continue our lifesaving work without you, so please use your network to help and invite everyone you know! All are welcome, so spend an evening celebrating our accomplishments this year and help us continue our mission in the new year. If you have any questions, feel free to contact our Event Coordinator. Be sure to check out our HART Holiday Party Facebook page for updates and photos of the raffle and silent auction items. Also help spread the word about the party by sharing the event and checking "Going" if you plan to attend! Tickets to the Holiday party are $25 each and include food, beer, wine, soft drinks, desserts, and a goodie bag with 5 raffle tickets. Children 12 and under are free. Visit the Tickets section for more information and to purchase tickets. No work on your part, well except to smile! It only involves making a pledge in advance of the party. And, if you are okay with it, you will have a name badge the night of the party and special recognition - so we really hope you and anyone you care to invite will attend. Your generous contribution will go a long way in helping HART cover the medical, food, and boarding costs associated with rescue. Be a hero to these deserving animals and help HART save even more lives next year! Multiple pledge levels are available! Visit the Host Committee section for more information and to donate. We have a lot of volunteer opportunities, and every volunteer who signs up will receive free entry to the event. We promise you'll still have time to enjoy the evening, food, drinks and festivities all while helping raise money for the animals at HART. Visit the Volunteer section for more information and to sign up! We need help gathering silent auction and raffle prize donations (wine, beer, spirits, gift cards, winery passes, B&B stays, vacation rentals, handmade items, new pet products, etc.) and empty baskets (especially large ones!). We also need extra wine for our wine ring toss game. Volunteers can contact our Event Coordinator with questions or for a donation pick up.